This is a high-quality and professional In-Line Air Flow Regulator, airflow valve by ZHONG AN AIR TOOLS.1/4-Inch Male NPT & 1/4-Inch Female NPT, suitable for all 1/4 inch air tools and air compressor. Solid brass construction.And works great for control airflow.This tapered 1/4-Inch Female NPT is more easier and quicker to connect air tools. To buy or not to buy, it's a real question. ZHONG AN AIR TOOLS is a professional shop to provide decent tools. We are committed to high quality and reasonable price. We don't want one-time transaction, we do really hope you can become a regular customer. And we're 100% confident about our products. So why not? Come on ,Just give us a chance and make a new try, you can make story between you and our products. ✔ Works great for precise control airflow. ✔ Suitable for all 1/4 inch air tools and air compressor. 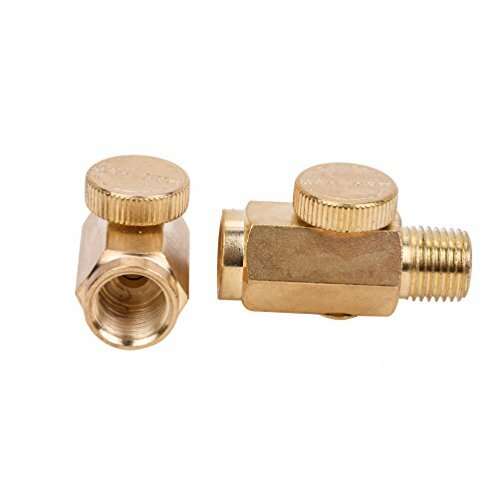 ✔ 1/4-Inch Male NPT & 1/4-Inch Female NPT airflow valve. ✔ Tapered 1/4-Inch Female NPT is more easier and quicker to connect air tools. If you have any questions about this product by ZHONG AN, contact us by completing and submitting the form below. If you are looking for a specif part number, please include it with your message.